(CNN) -- Sauber have been involved in Formula One since 1993, but arguably the team's greatest contribution to the sport has been handing a debut to double world champion Sebastian Vettel at the 2007 U.S. Grand Prix. In addition to Vettel, world champions Jacques Villeneuve and Kimi Raikkonen -- who is returning to F1 this year with Lotus -- have also had stints with Sauber. The Swiss team scored the same number of points in 2011 as in the previous campaign -- 44 -- but that still represented an improvement from eighth to seventh in the overall standings. Sauber suffered a disappointing disqualification from last season's opening race in Australia after breaching regulations relating to the maximum size of a car's rear wing. 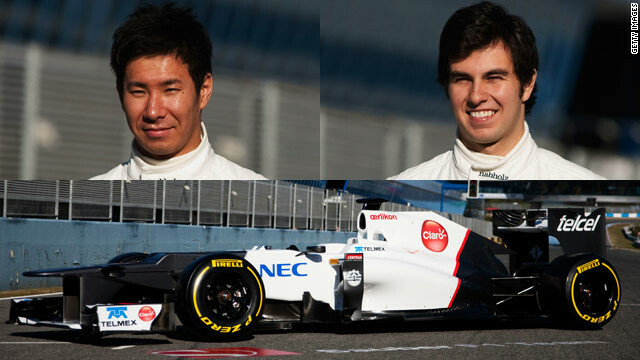 The 25-year-old is Japan's sole representative in F1 and is entering his third year with Sauber. After his rookie season was blighted by eight retirements, Kobayashi enjoyed better luck in 2011 and crossed the finishing line in all but three of the year's 19 races. Kobayashi finished 12th in the drivers' standings for the second year in a row with 30 points, two below his 2010 total. The 2009 GP2 Asia Series champion recorded the best finish of his career at last season's Monaco Grand Prix, where he came fifth. The Mexican saw his F1 debut ruined by Sauber's disqualification from the Australian Grand Prix, after he had impressed many by crossing the line seventh despite taking just one pit stop. Perez was involved in a sickening high-speed crash in Monaco, when his car skidded sideways into a barrier during qualifying. The incident left the 22-year-old concussed and forced him to miss the marquee race as well as the following Canadian Grand Prix. Perez finished last season 16 points adrift of Kobayashi, with the highlight of his year being a seventh-place finish at July's British Grand Prix.